325. The teaching of the Master (cf. Mt 22:30) and Saint Paul (cf. 1 Cor 7:29-31) on marriage is set - and not by chance - in the context of the ultimate and definitive dimension of our human existence. We urgently need to rediscover the richness of this teaching. By heeding it, married couples will come to see the deeper meaning of their journey through life. As this Exhortation has often noted, no family drops down from heaven perfectly formed; families need constantly to grow and mature in the ability to love. This is a never-ending vocation born of the full communion of the Trinity, the profound unity between Christ and his Church, the loving community which is the Holy Family of Nazareth, and the pure fraternity existing among the saints of heaven. Our contemplation of the fulfillment which we have yet to attain also allows us to see in proper perspective the historical journey which we make as families, and in this way to stop demanding of our interpersonal relationships a perfection, a purity of intentions and a consistency which we will only encounter in the Kingdom to come. It also keeps us from judging harshly those who live in situations of frailty. All of us are called to keep striving towards something greater than ourselves and our families, and every family must feel this constant impulse. Let us make this journey as families, let us keep walking together. What we have been promised is greater than we can imagine. May we never lose heart because of our limitations, or ever stop seeking that fullness of love and communion which God holds out before us. 389 Cf. John Paul II, Apostolic Exhortation Familiaris Consortio (22 November 1981), 44: AAS 74 (1982), 136. 390 Ibid., 49: AAS 74 (1982), 141. 391 For the social aspects of the family, cf. Pontifical Council for Justice and Peace, Compendium of the Social Doctrine of the Church, 248-254. 388 Relatio Finalis 2015, 88. 322. All family life is a "shepherding" in mercy. Each of us, by our love and care, leaves a mark on the life of others; with Paul, we can say: "You are our letter of recommendation, written on your hearts...not with ink, but with the Spirit of the living God" (2 Cor 3:3-2). Each of us is a "fisher of men" (Lk 5:10) who in Jesus' name "casts the nets" (cf. Lk 5:5) to others, or a farmer who tills the fresh soil of those whom he or she loves, seeking to bring out the best in them. Marital fruitfulness involves helping others, for "to love anybody is to expect from him something which can neither be defined nor foreseen; it is at the same time in some way to make it possible for him to fulfill this expectation".387 This is itself a way to worship God, who has sown so much good in others in the hope that we will help make it grow. 387 Gabriel Marcel, Homo Viator: prolégomènes à une métaphysique de l'espérance, Paris, 1944, p. 66. English: Homo Viator. An Introduction to a Metaphysics of Hope, London, 1951, p. 49. 383 Second Vatican Ecumenical Council, Decree on the Apostolate of the Laity Apostolicam Actuositatem, 11. 384 Catechesis (10 June 2015): L'Osservatore Romano, 11 June 2015, p.8. 385 John Paul II, Apostolic Exhortation Familiaris Consortio (22 November 1981), 12: AAS 74 (1982), 93. 386 Address at the Prayer Vigil of the Festival of Families, Philadelphia (26 September 2015): L'Osservatore Romano, 28-29 September 2015, p.6. 320. There comes a point where a couple's love attains the height of its freedom and becomes the basis of a healthy autonomy. This happens when each spouse realizes that the other is not his or her own, but has a much more important master, the one Lord. No one but God can presume to take over the deepest and most personal core of the loved one; he alone can be the ultimate center of their life. At the same time, the principle of spiritual realism requires that one spouse not presume that the other can completely satisfy his or her needs. The spiritual journey of each - as Dietrich Bonhoeffer nicely put it - needs to help them to a certain "disillusionment" with regard to the other,382 to stop expecting from that person something which is proper to the love of God alone. This demands an interior divestment. The space which each of the spouses makes exclusively for their personal relationship with God not only helps heal the hurts of life in common, but also enables the spouses to find in the love of God the deepest source of meaning in their own lives. Each day we have to invoke the help of the Holy Spirit to make this interior freedom possible. 382 Cf. Gemeinsames Leben, Munich, 1973, p.18. English: Life Together, New York, 1954, p.27. 319. Marriage is also the experience of belonging completely to another person. Spouses accept the challenge and aspiration of supporting one another, growing old together, and in this way reflecting God's own faithfulness. This firm decision, which shapes a style of life, is an "interior requirement of the covenant of conjugal love",380 since "a person who cannot choose to love forever can hardly love for even a single day".381 At the same time, such fidelity would be spiritually meaningless were it simply a matter of following a law with obedient resignation. Rather, it is a matter of the heart, into which God alone sees (cf. Mt 5:28). Every morning, on rising, we reaffirm before God our decision to be faithful, come what may in the course of the day. And all of us, before going to sleep, hope to wake up and continue this adventure, trusting in the Lord's help. In this way, each spouse is for the other a sign and instrument of the closeness of the Lord, who never abandons us: "Lo, I am with you always, to the close of the age" (Mt 28:20). 380 John Paul II, Apostolic Exhortation Familiaris Consorio (22 November 1981), 11: AAS 74 (1982), 93. 381 Id., Homily at Mass with Families, Cordoba, Argentina (8 April 1987), Insegnamenti X/1 (1987), 1161-1162. 376 Cf. Relatio Finalis 2015, 87. 377 Cf. John Paul, II, Apostolic Exhortation Familiaris Consortio (22 November 19891), 57: AAS 74 (1982), 150. 378 Nor should we forget that God's covenant with his people is expressed as an espousal (cf. Ez 16:8, 60; Is 62:5; Hos 2:21-22), and that the new covenant is also presented as a betrothal (cf. Rev 19:7; 21:2; Eph 5:25). 379 Second Vatican Ecumenical Council, Dogmatic Constitution on the Church Lumen Gentium, 11. 374 Relatio Finalis 2015, 87. 375 John Paul II, Post-Synodal Apostolic Exhortation Vita Consecrata (25 March 1996), 42: AAS 88 (1996), 416. 316. A positive experience of family communion is a true path to daily sanctification and mystical growth, a means for deeper union with God. The fraternal and communal demands of family life are an incentive to growth in openness of heart and thus to an ever fuller encounter with the Lord. The word of God tells us that "the one who hates his brother is in the darkness, and walks in the darkness" (1 Jn 2:1); such a person "abides in death" (1 Jn 3:14) and "does not know God" (1 Jn 4:8). My predeccessor Benedict XVI pointed out that "closing our eyes to our neighbour also blinds us to God",370 and that, in the end, love is the only light which can "constantly illuminate a world grown dim".371 If only we "love one another, God abides in us and his love is perfected in us" (1 Jn 4:12). Since "the human person has an inherent social dimension",372 and "the first and basic expression of that social dimension of the person is the married couples and the family",373 spirituality becomes incarnate in the communion of the family. Hence, those who have deep spiritual aspirations should not feel that the family detracts from their growth in the life of the Spirit, but rather see it as a path which the Lord is using to lead them to the heights of mystical union. 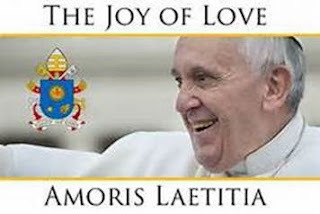 370 Encyclical Letter Deus Caritas Est (25 December 2015), 16: AAS 98 (2006), 230. 371 Ibid., 39: AAS 98 (2006), 250. 372 John Paul II, Post-Synodal Apostolic Exhortation Christifideles Laici (30 December 1988), 40: AAS 81 (1989), 468. 315. The Lord's presence dwells in real and concrete families, with all their daily troubles and struggles, joys and hopes. Living in a family makes is hard for us to feign or lie; we cannot hide behind a mask. If that authenticity is inspired by love, then the Lord reigns there, with his joy and his peace. The spirituality of family love is made up of thousands of small but real gestures. In that variety of gifts and encounters which deepen communion, god has his dwelling place. This mutual concern "brings together the human and the diving".369 for it is filled with the love of God. In the end, marital spirituality is a spirituality of the bond, in which divine love dwells. 369 Second Vatican Ecumenical Council, Pastoral Constitution on the Church in the Modern World Gaudium et Spes, 49. 314. We have always spoken of how God dwells in the hearts of those living in his grace. Today we can add that the Trinity is present in the temple of marital communion. Just as God dwells in the praises of his people (cf. Ps 22:3), so he dwells deep within the marital love that gives him glory. 313. Charity takes on different hues, depending on the state of life to which we have been called. Several decades ago, in speaking of the lay apostolate, the Second Vatican Council emphasized the spirituality born of family life. The Council stated that lay spirituality "will take its particular character from the circumstances of... married and family life".367 It is worth pausing to describe certain basic characteristics of this specific spirituality that unfolds in family life and its relationships. 367 Decree on the Apostolate of the Laity Apostolicam Actuositatem, 4. 312. This offers us a framework and a setting which help us avoid a cold bureaucratic morality in dealing with more sensitive issues. Instead, it sets us in the context of a pastoral discernment filled with merciful love, which is ever ready to understand, forgive, accompany, hope, and above all integrate. That is the mindset which should prevail in the Church and lead us to "open our hearts to those living on the outermost fringes of society".366 I encourage the faithful who find themselves in complicated situations to speak confidently with their pastors or with other lay people whose lives are committed to the Lord. They may not always encounter in them a confirmation of their own ideas or desires, but they will surely receive some light to help them better understand their situation and discover a path to personal growth. I also encourage the Church's pastors to listen to them with sensitivity and serenity, with a sincere desire to understand their plight and their point of view, in order to help them live better lives and to recognize their proper place in the Church. 366 Bull Misericordiae Vultus (11 April 2015), 15: AAS 107 (2015), 409. 363 Cf. ibid., 36-37: AAS 105 (2013), 1035. 364 Perhaps out of a certain scrupulosity, concealed beneath a zeal for fidelity to the truth, some priests demand of penitents a purpose of amendment so lacking in nuance that it causes mercy to be obscured by the pursuit of a supposedly pure justice. For this reason, it is helpful to recall the teaching of Saint John Paul II, who stated that the possibility of a new fall "should not prejudice the authenticity of the resolution" (Letter to Cardinal William W. Baum on the occasion of the Course on the Internal Forum organized by the Apostolic Penitentiary [22 March 1996], 5: Insegnamenti XIX/1 , 589). 365 International Theological Commission, The Hope of Salvation for the Infants Who Die Without Being Baptized (19 April 2007), 2. 362 Apostolic Exhortation Evangelii Gaudium (24 November 2013), 47: AAS 105 (2013), 1040. 358 Bull Misericordiae Vultus (11 April 2015), 12: AAS 107 (2015): 407. 355 Apostolic Exhortation Evangelii Gaudium (24 November 2013), 44: AAS 105 (2013), 1038. 307. In order to avoid all misunderstanding, I would point out that in no way must the Church desist from proposing the full ideal of marriage, God's plan in all its grandeur: "Young people who are baptized should be encouraged to understand that the sacrament of marriage can enrich their prospects of love and that they can be sustained by the grace of Christ in the sacrament and by the possibility of participating fully in the life of the Church".354 A lukewarm attitude, any kind of relativism, or an undue reticence in proposing that ideal, would be a lack of fidelity to the Gospel and also of love on the part of the Church for young people themselves. To show understanding in the face of exceptional situations never implies dimming the light of the fuller ideal, or proposing less than what Jesus offers to the human being. Today, more important than the pastoral care of failures is the pastoral effort to strengthen marriages and thus to prevent their breakdown. 354 Relatio Synodi 2014, 26. 353 De Catechizandis Rudibus, I, 14, 22: PL 40, 327; cf. Apostolic Exhortation Evangelii Gaudium (24 November 2013), 194: AAS 105 (2013), 1101. 305. For this reason, a pastor cannot feel that it is enough simply to apply moral laws to those living in "irregular" situations, as if they were stones to throw at people's lives. This would bespeak the closed heart of one used to hiding behind the Church's teachings, "sitting on the chair of Moses and judging at times with superiority and superficiality difficult cases and wounded families".349 Along these same lines, the International Theological Commission has noted that "natural law could not be presented as an already established set of rules that impose themselves a priori on the moral subject; rather, it is a source of objective inspiration for the deeply personal process of making decisions".350 Because forms of conditioning and mitigating factors, it is possible that in an objective situation of sin - which may not be subjectively culpable, or fully such - a person can be living in God's grace, can love and can also grow in the life of grace and charity, while receiving the Church's help to this end.351 Discernment must help to find possible ways to responding to God and growing in the midst of limits. By thinking that everything is black and white, we sometimes close off the way of grace and growth, and discourage paths of sanctification which give glory to God. Let us remember that "a small step, in the midst of great human limitations, can be more pleasing to God than a life which appears outwardly in order, but moves through the day without confronting great difficulties".352 The practical pastoral care of ministers and of communities must not fail to embrace this reality. 349 Address for the Conclusion of the Fourteenth Ordinary General Assembly of the Synod of Bishops (24 October 2015): L'Osservatore Romano, 26-27 October 2015, p.13. 350 International Theological Commission, In Search of a Universal Ethic: A New Look at Natural Law (2009), 59. 351 In certain cases, this can include the help of the sacraments. Hence, "I want to remind priests that the confessional must not be a torture chamber, but rather an encounter with the Lord's mercy" (Apostolic Exhortation Evangelii Gaudium [24 November 2013], 44: AAS 105 , 1038. I would also point out that the Eucharist "is not a prize for the perfect, but a powerful medicine and nourishment for the weak" (ibid., 47: 1039). 352 Apostolic Exhortation Evangelii Gaudium (24 November 2013), 44: AAS 105 (2013), 1038-1039.